You know those dishes that you love, but you’ll only eat if they’re homemade? For me that’s any sort of salad made with mayo (chicken salad, tuna salad, potato salad, etc.). 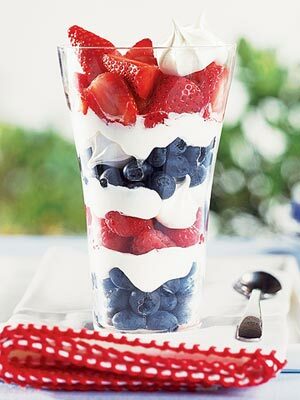 I usually like a lot more fixin’s and a lot less mayo than what receipes typically call for. Not to mention I most often wind up throwing in some dijon mustard or vinegar – I love the added tang. 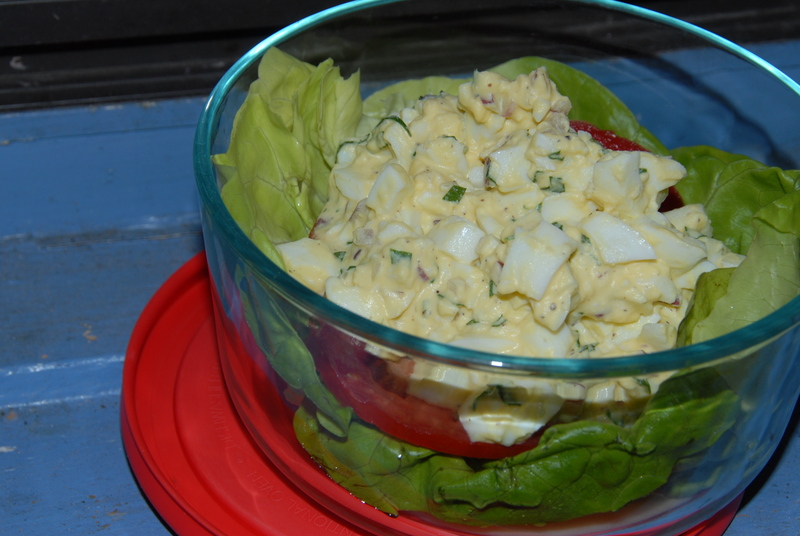 I decided to make egg salad this week (to top some beautiful tomatoes I got at the farmers market last weekend!) just the way I like it and chocked full of tarragon. Hard boil the eggs (a good trick – don’t use fresh eggs – they are harder to peel!) – put eggs in a large pot and just cover with water. Let the water come to a boil, cover, remove from the heat and let stand for 10 minutes. Let the eggs cool and peel. 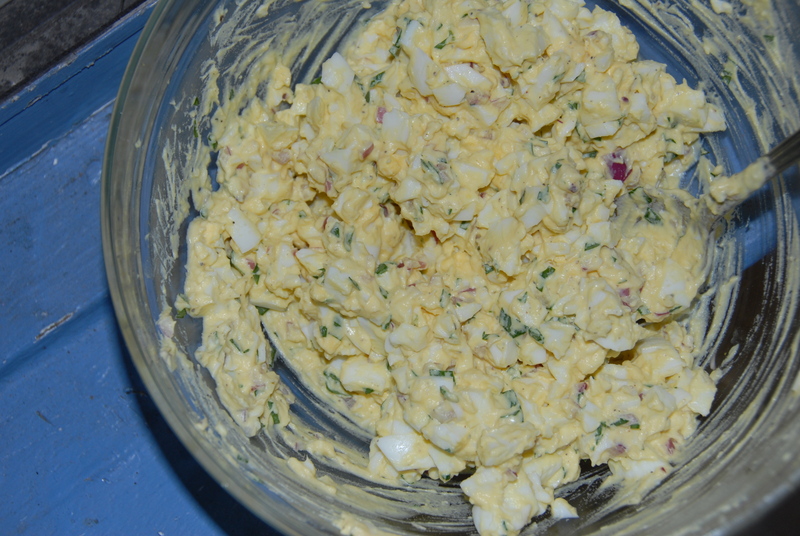 Chop the cooled hard boiled eggs and place in a large bowl along with all other ingredients. Mix well and add plenty of salt and pepper. Be sure to taste as you season! Layer the salad on bread or in a bowl over lettuce and tomato – a perfect, pack-able lunch! If you’re keeping an herb garden this summer chances are they’re already growing like weeds…threatening to take over whatever pot you planted them in or half of your well thought out garden…time to snip a few and get cooking! If you happened plant tarragon you’re in luck! – we’ll have 2 new recipes to make use of the flavorful and feathery herb coming your way next week! Summer is THE best time to cook in my mind – the markets are full of fresh produce, half the time you don’t even need to turn on an oven to make a wonderful meal but it’s also a really really busy time of year. All the fun and running out of town every weekend has left my kitchen feeling neglected (with the exception of my coffee pot). But it was high time to get back on the horse and for some reason, perhaps it’s been all the rainy days, I’ve been craving pasta. Like, loads and loads of linguine. I have a tiny bit of self-restraint so instead of making Bolognese and kissing the dreams of fitting into a bathing suit sometime in the near future goodbye, I opted for a rather healthy pasta salad to share at a lovely picnic with friends. Prepare the pasta and set aside to cool in a large bowl. While it’s still warm toss the pasta with a touch of olive oil and S&P. Toast the nuts until fragrant and lightly browned in a dry sauté pan over medium high heat and set aside to cool. 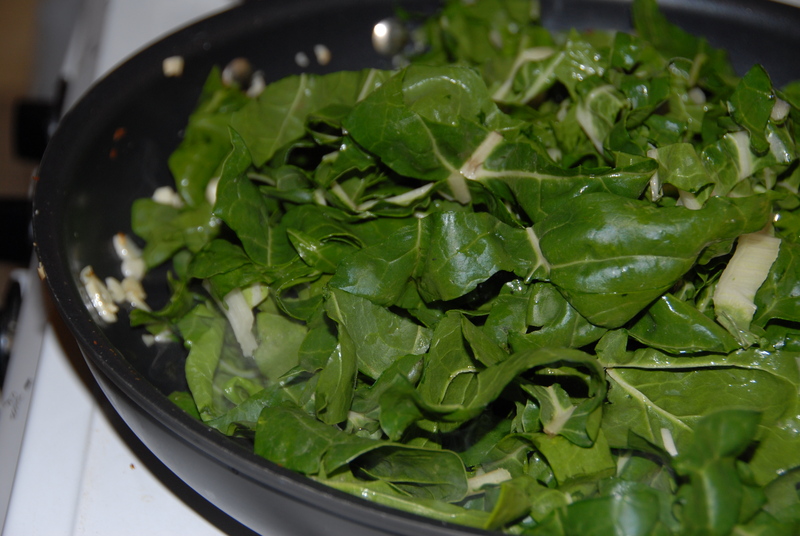 In a large sauté pan heat the sliced garlic in olive oil until fragrant – add in the sliced Swiss chard and cook until just starting to wilt. 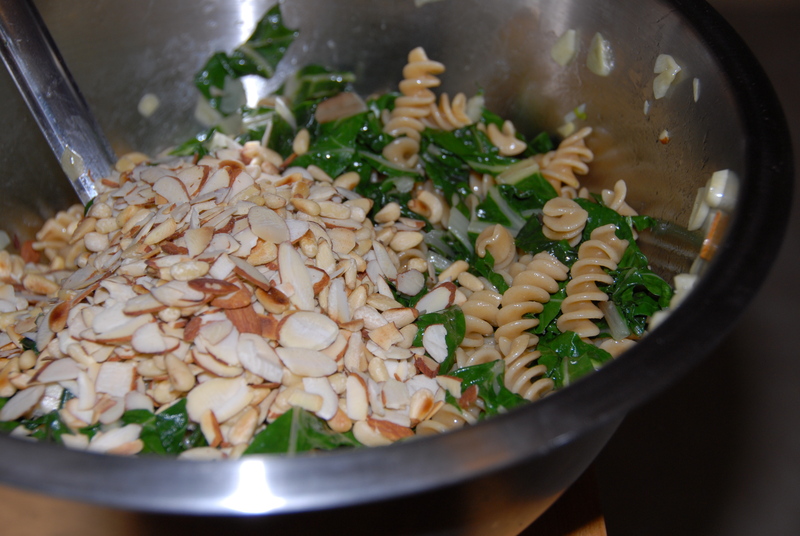 Combine all ingredients in the large bowl with the pasta and mix well. Add in about 3T of olive oil to coat. 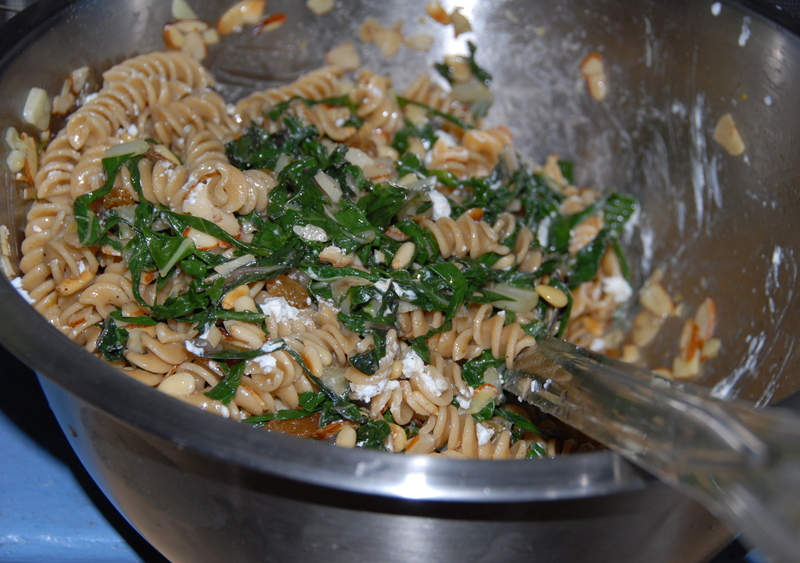 Taste and season the pasta with S&P, zest and juice of the lemon and a touch of balsamic vinegar for a little zing. 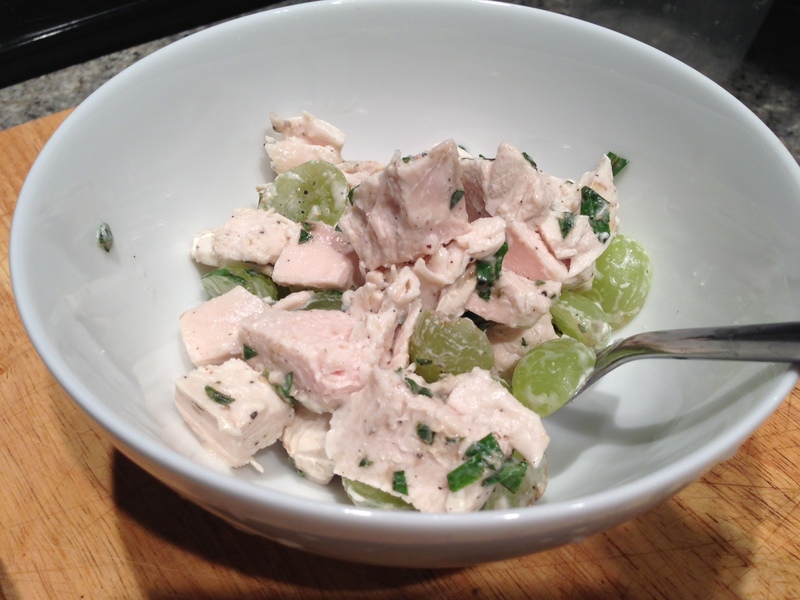 Once the pasta salad is cool add the raisins and goat cheese in haphazard chunks. Serve slightly chilled or room temp. And if you happen to have some extra Swiss chard on hand…go Greek with it and try this delicious Tzatziki-esque Martha Stewart recipe – I served it with herbed pita bread – so tasty and refreshing! I spent last weekend driving around New Mexico eating my weight in green chili cheeseburgers… so I decided to take a lighter approach to this week’s post. Now a swiss chard smoothie may sound absolutely foul, but it is surprisingly delicious and refreshing — not to mention chock-full of nutrients! 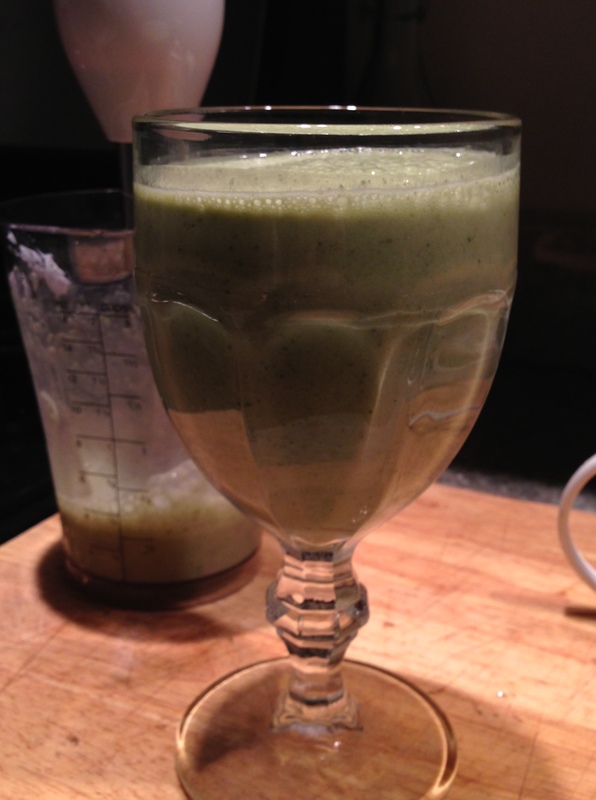 Combine all ingredients in a blender or in an immersion blender type vehicle, blend and enjoy! Second only to spinach in the rankings of the worlds most nutrient rich vegetables, this Mediterranean favorite is not only beautiful AND healthy, it’s delicious! 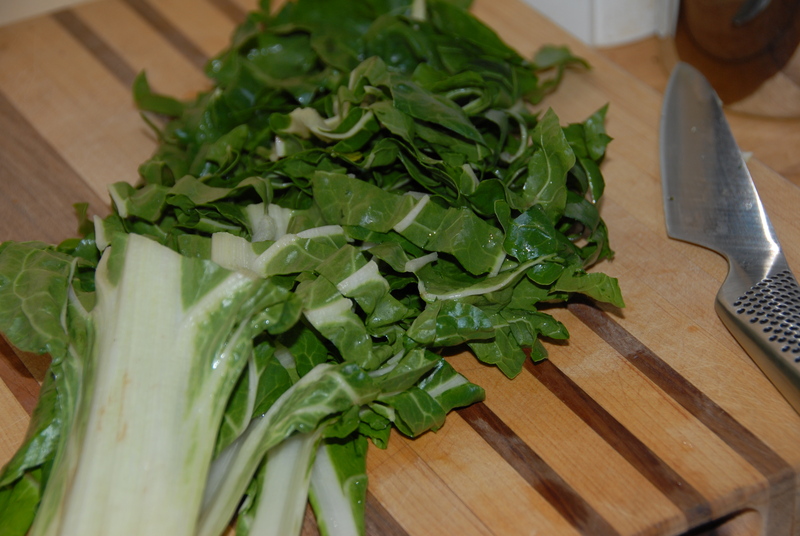 Check back next week to see just how we handled this fabulous leafy green!